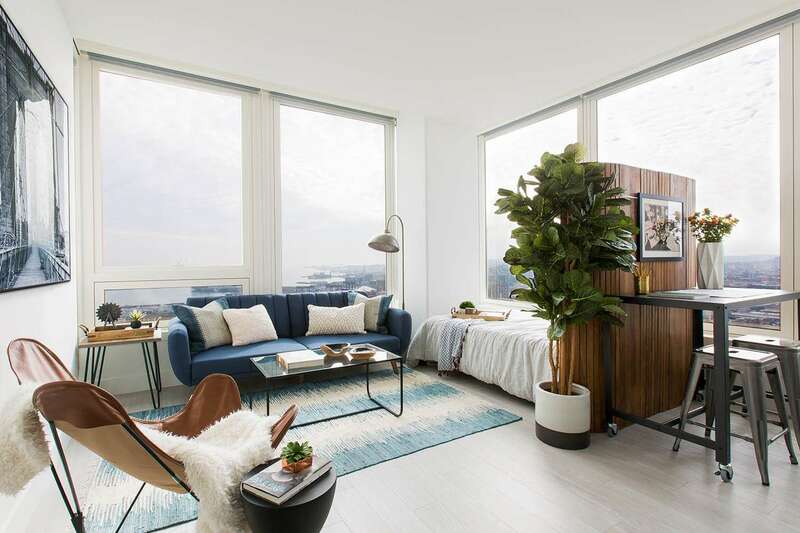 Studio Apartment Ideas: If your apartment is just one room—with no walls to separate the bedroom from the living room—it probably resembles a dorm room more than a grown-up’s home. What can you do? Plenty. Even if you are not working with excess square footage, there are many tricks for creating distinct areas in a small place for sleeping, working, or just hanging out. 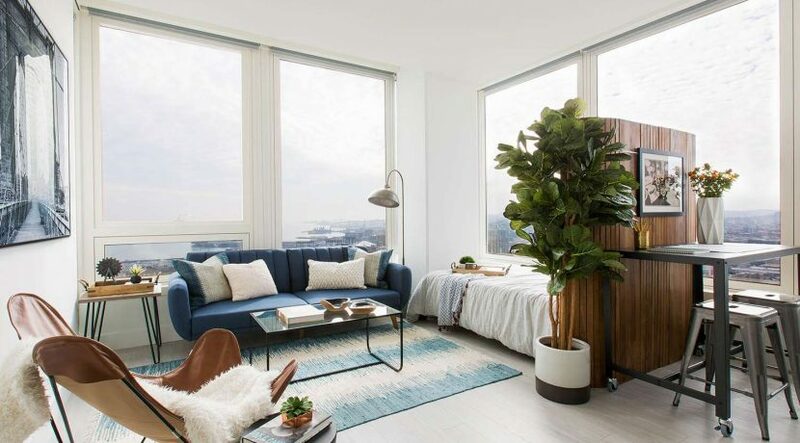 Create a Larger Living Room- This New York City apartment is a tiny, urban oasis brimming with style. The designers at LABLstudio chiseled out separate spots for sleeping, working, and entertaining by dividing the single room apartment in half.They borrowed some of the bedroom square footage—which starts at the back of the apartment—to establish a larger living room with a small home office near the front windows. A wallpaper feature wall enhances the sense of separation between the bedroom and living room. Create Separation With Room Divider Curtains- Room divider curtains conceal a queen-sized bed in this 450-square foot studio by Benjamin Hall Design and Build based in Phoenix, Arizona. Install Sliding Doors -The smart designers at Facet 14 Studio turned a nook in this New York City studio apartment into a private bedroom by installing sliding doors that glide on a built-in track near the ceiling. Build a Temporary Half Wall-A temporary half wall divides the square footage in this Scandinavian studio apartment spotted on Alvhem Makleri. This is a particularly good idea for a rental where building something permanent is prohibited. Add Character with a Bespoke Room Divider- The interior designers at The Brooklyn Home Company combined weathered wood with custom storage to create some privacy for a bedroom in this New York City studio apartment. The bespoke room divider adds rustic character to the shabby chic living room. Try a Bookcase Divider-Blogger Jackie Claire from York Avenue used an IKEA KALLAX shelving unit to divide her tiny studio apartment into two distinct living areas. The best part: The smart piece of storage furniture cost less than $110.This particular furniture collection can be customized with add-on parts—drawers, baskets, and colorful storage boxes—that add personality while providing concealed storage.